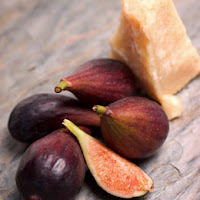 If desired, remove stems from figs. Place figs in a medium sacuepan; cover with water. Bring to boiling; reduce heat. Simmer, covered, for 5 minutes. Drain well; cool slightly. In a skillet melt butter over medium heat; add onion. Cook and stir about 5 minutes or unitl brown. Stir in drained figs and thyme. Cook, stirring gently, about 2 minutes or until slightly softened. Stir in balsamic vinegar. Cook for 2 to 3 minutes more or until glazed. To serve, place the goat cheese in a serving bowl. Spoon the fig mixture over cheese.